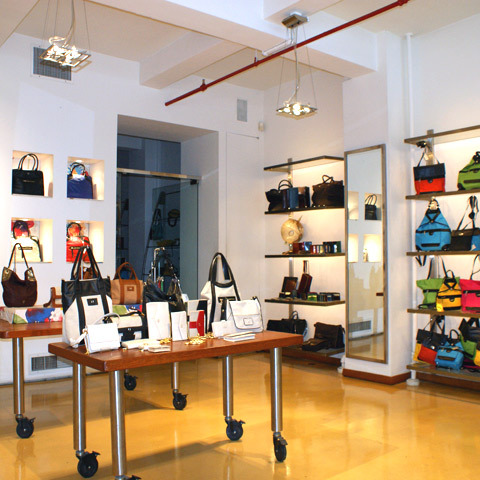 Chelsea’s Tusk flagship boutique brings an Indian flair to Manhattan with its sophisticated yet richly hued stock of handbags, backpacks, wallets and more. The company was first established in 1990 by India-native Hiten Manseta, and the Chelsea storefront has been brightening up the neighborhood since its opening in 2004. A defining trait of the brand is that many of the supple leather accessories are adorned with a metal tusk detail that harkens back to the founder’s birthplace. And while the elephant motif isn’t the only charming feature that sets this brand apart, the sleek design, spice-inspired color palette and quality of the leather also enhance the appeal of a Tusk product. Keeping with the exotic theme, Tusk also carries fine leather travel accessories for both men and women alike, such as luggage tags, passport covers and duffel bags. Don't let the beautiful supple leathers and fabulous designs trick you into thinking that they are too expensive to afford. Tusk's inviting inventory of classic and refined accessories are well made, long lasting and easy on the wallet. Monday through Friday: 11 a.m. to 6:30 p.m.
Handbags, accessories and gifts ranging in a variety of sleek designs made for hardworking men and gals. Known for their top grainy Italian leather, these functional, yet chic handbags attracts statement power-dressing costumers. Founded in NYC by Hiten Manseta, principal designer and owner of Tusk - specializing in handbags and small leather goods for men and women. Manseta opened his sleek flagship boutique & showroom in the Chelsea neighborhood back in 2004. Manseta began his design career working with the famous fashion designer Halson. Expect to discover high-end finely contoured designs: messenger bags, travel bags, wallets, billfolds and many other personal accessories such as small mirrors, jewelry boxes, travel bags & cosmetic bags. All designs are fabricated from fine Italian leathers and handmade hardware accents from artisans in Italy and Japan. If you care about what you see when opening your bag then you will appreciate the workmanship and designs that Tusk offers. manhattan > chelsea > tusk - new location!